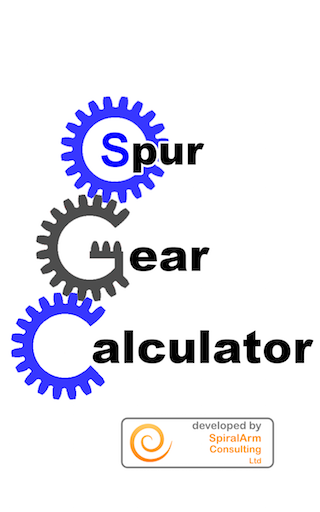 Spur Gear Calculator has been developed by SpiralArm Consulting Limited and Gear Services (Letchworth) Limited as a collection of gear data calculators for use on either a Android phone or Android tablet. This app can be used calculate the Outside Diameter, Centre Distance and Ratio of spur gears and pinions. Please note that this calculator should ONLY be used for spur gears and pinions, NOT for helical gears. This app was initially developed for use with the spur gears and pinions available via the Ultrascale web site. However, it can be used for spur gears and pinions from other sources. The two gear systems used in this app are Diametral Pitch and Module and assume you are using standard full depth-teeth. 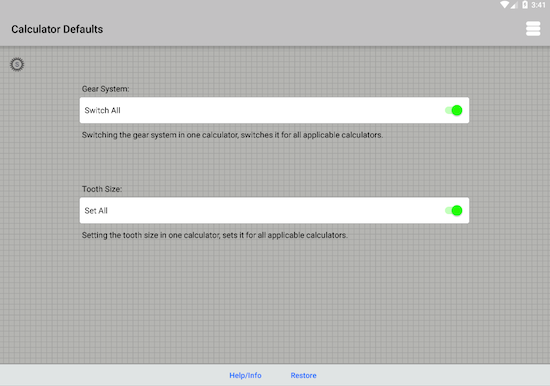 When switching gear systems the calculators will also convert the currently set tooth size to the new gear system. For example if you have the calculators set for Diametral Pitch and the Tooth Size set to 100 and you then change the gear system to Module the 100 will be converted to Module (i.e. 0.254) and the reverse also applies. 1. Select required gear system. (Diametral Pitch or Module) Clicking on the currently displayed system will switch to the other. 2. Enter tooth size for selected gear system. 3. Enter the number of teeth for the spur gear. 4. Click 'Calculate' to displayed the result. 5. 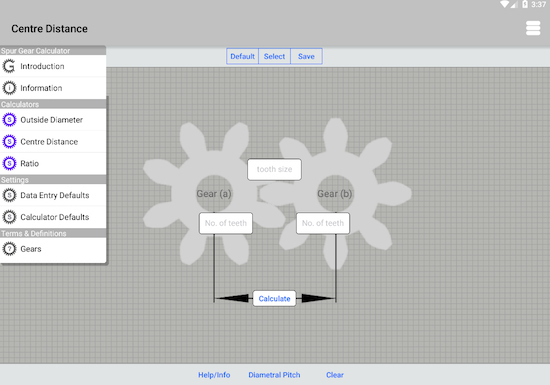 To do another calculation using the same gear system, click on 'Clear' this will reset both the 'Number of Teeth' and the 'Calculate' button for the next calculation. Loads input data that is currently setup via the apps 'Data Entry Defaults' in 'Settings'. Allows you to select input data that you have previously saved using the Save option. Saves the current input data so you can keep it for later use, by selecting it with the Select option. All Data Entry Defaults and Saved input data will be kept until either you delete it or uninstall the app. The information you are currently reading. This switches the gear system between either Diametral Pitch or Module. This clears both data entered and results, ready for the next calculation. The number of teeth shown in the Outside Diameter calculator can be copied to the same field type in any of the other calculators. This is done by clicking on 'Gear' and then selecting the calculator and field to 'copy to', from the displayed menu. Clicking on 'Close' at the bottom of this menu will cancel this operation and close the menu. The 'Copy to' menu is active once the current calculation is done and result displayed. This calculator is used to calculate the outside diameter of a spur gear. The outside diameter that the calculator returns is for the gear at the correct size. However, this size will vary slightly on the finished item due to manufacturing tolerances. 3. Enter the number of teeth for each of the two spur gears. 5. 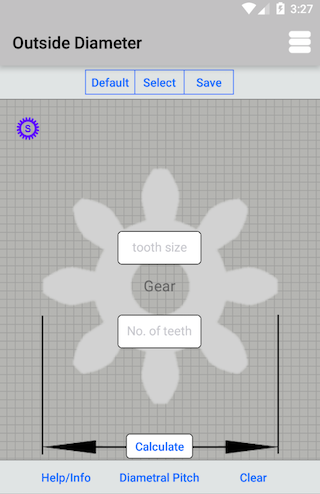 To do another calculation using the same gear system, click on 'Clear' this will reset both the 'Number of Teeth' for both gears and the 'Calculate' button for the next calculation. 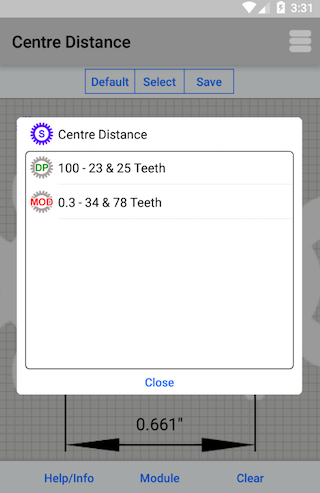 The number of teeth shown in the Centre Distance calculator can be copied to the same field type in any of the other calculators. This is done by clicking on either 'Gear (a)' or 'Gear (b)' depending on which number of teeth you wish to copy. Then select the calculator and field to 'copy to', from the displayed menu. Clicking on 'Close' at the bottom of this menu will cancel this operation and close the menu. This calculator is used to calculate the centre distance between two mating spur gears. The centre distance that the calculator returns is for the two gears in tight mesh. Some allowance will have to be made for backlash. This amount will vary depending on the tooth size of the gears and the manufacturing tolerances. However, adding 0.004 inches [0.1 mm] to the calculated centre distance, for the spur gears available via the Ultrascale web site, be enough. 2. Click 'Calculate' to displayed the result. 3. To do another calculation, click on 'Clear' this will reset the 'Number of teeth' for both the Driver and Driven gears and the 'Calculate' button for the next calculation. The number of teeth shown in the Gear Ratio calculator can be copied to the same field type in any of the other calculators. This is done by clicking on either 'Driver Gear' or 'Driven Gear' depending on which number of teeth you wish to copy. Then select the calculator and field to 'copy to', from the displayed menu. Clicking on 'Close' at the bottom of this menu will cancel this operation and close the menu. This calculator is used to calculate the ratio of the number of teeth on the mating gears. The top button bar as three options. 'Default' - This loads the input data fields with the data preset in the 'Data Entry Defaults' section of the app. 'Select' - This displays a list of input data saved using the 'Save' option. This input data can then be loaded into the input data fields by clicking on it. To delete an entry from the Select list, swipe the required entry to the left and click on 'Delete'. 'Save' - This saves the currently displayed input data for later use, by using the 'Select' option. The bottom toolbar has a number of options depending on the calculator in use at the time. But all calculators have the same basic options. 'Help/Info' - This displays the help for the calculator. 'Diametral Pitch/Module' - This toggles between the two gear systems (not in Ratio calculator). 'Clear' - This clears both input and output data from the calculator ready for the next calculation. Here you can enter some default data to be used in the calculators. This data includes Gear System, Tooth Size and Number of Teeth. On this page both the gear system and the tooth size can be set so they have an effect on all applicable calculators or just the individual calculator.